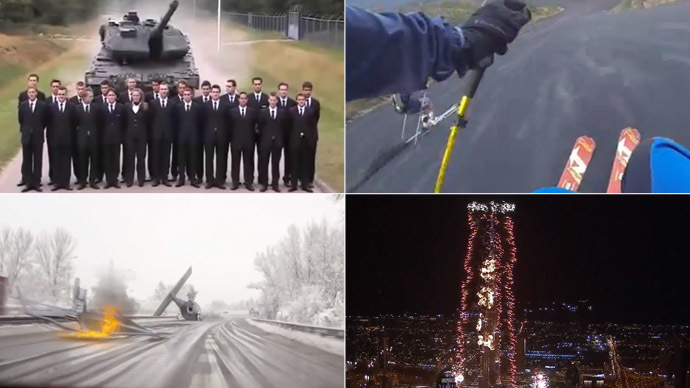 Away from political turmoil and protests, there were plenty of lighter moments in 2014. From marriage proposals gone wrong to superhuman Russian cops, skiing down a volcano and a Star Wars crash on a German motorway. This year had it all. An enthusiastic Dutchman wanted to give his girlfriend a morning surprise in more ways than one. He hired a crane to be lifted to her bedroom window with the intention of asking for her hand in marriage. Everything appeared to be going swimmingly until the crane buckled and went crashing into a neighbor’s roof. Then things quickly went from bad to worse. Upon trying to fix the crane, it slipped again and fell straight back on to the house. Meanwhile, the fearless girlfriend did accept the marriage proposal, Dutch media reported. The lovebirds have gone on a Parisian holiday to celebrate. That would certainly have been good advice to the group of 23 young men and women standing in the middle of a road. Behind them was a 63 ton tank advancing at its top speed of 70 kilometers an hour. However, the West German-built Leopard II tank, which costs $5 million, stopped in its tracks, just meters from the group who had their backs turned. Some amateur commenters have also suggested that the video may have been two separate recordings spliced together using a green screen, although if this was the case, it appears to have been a highly professional production. What began as a car chase somewhere in snowy provincial Russia turned into a Terminator-style scene as a cop charged after a vehicle on foot. The footage, recorded by a dashboard camera inside a police car, shows a night pursuit of an off-road car on a narrow slippery road. After some 20 seconds an officer jumps out of the moving patrol car into the snow and chases down the getaway vehicle on foot. In one ferocious charge, the policeman reaches the fleeing car, flings its door open and jumps inside. Snow is not plentiful in the south of Italy, especially in late summer. There Marco Tomasello, who works as a tour guide at the 3,350 meter high Mount Etna in Sicily, decided to indulge one of his passions – skiing. He and a group of friends descended down the solidified volcanic lava slopes, while careful to dodge any stones that may have been in their way. The term “man's best friend” may be up for grabs after a cat saved a young toddler from probable death in California. The moggy pounced on a mutt that began mauling at the child's leg and pulled the four-year-old from his bike. At that moment, Tara the cat rushed to the rescue, attacking the dog and chasing it away. After the fracas, the cat returned to check on the boy, who was being attended to by his scared mom, who was just meters away watering plants when the incident happened. The child sustained several bites on his leg, which required stitches, but thanks to the cat, was otherwise fine. A motorist driving in Germany apparently passed the Tie Fighter with debris dotted across the highway, while two galactic storm troopers were casually waiting to be picked up. The footage was presumably created by a fan of the show and the clip was posted on the Facebook page of the Dein Sky Film channel. It has proved to be quiet a hit, and has already amassed an astronomic amount of views, in excess of 12.5 million. This is not the first time that a Star Wars fan clip has gone viral. Over the summer, YouTube user Frank Wunderlich turned Frankfurt Airport, one of Europe’s busiest, into an entirely different hub as it was transformed into the Imperial Starport. A man was waiting to cross a busy road in a small town in the Tula region, south of Moscow, when he found himself in the center of a terrible crash. A white SUV, breaking road rules and accelerating to turn left, completely ignored an oncoming truck approaching at high speed. As the SUV makes the turn just next to the bystander, the truck hits the vehicle, sending it spinning in a cloud of debris. The truck goes on for a short time before coming to a halt. Both vehicles miraculously missed the man. The French like a good protest. The country's farmers came up with an eye-catching and certainly strongly scented way to get the attention of local politicians. Up in arms about what they believe are increasing constraints and charges imposed by the European Union and French government on the nation's farmers, they dumped tons of manure in Toulouse and Nancy. They were creative, as well. Aside from regular trailers, they brought in muck spreaders to make even more of a mess. Hawks can be territorial and this bird of prey was no exception. Upon seeing a drone flying above a soccer field in Cambridge, Massachusetts, the bird made a beeline for the intruding device. Christopher Schmidt, who was flying the drone, said the bird “wasn’t too happy” with its presence and it was not long before it came crashing back down to Earth with a bang. Fireworks displays will be going off across the world when the clocks strike midnight on December 31. However, they will have some way to go if they are going to beat this display, which greeted locals in Dubai in 2014. A record-breaking 400,000-firework in the United Arab Emirates crowned an extravagant New Year’s celebrations. Almost half a million fireworks were set off from 400 locations using 100 computers. This included the world's tallest tower Burj Khalifa, which was turned into a gigantic fireworks launcher, bursting forth an array of colorful lights into the Dubai sky as part of the city’s Guinness World Record bid.